I feel guilty about how happy eating makes me. 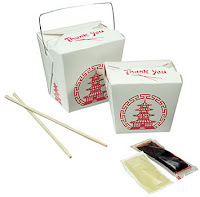 If I get an msg-laden brown bag full of Chinese food, my brain soon reaches ethereal bliss. I become happy, not due to circumstance, but due to ingredients. And I don't like this about myself. While, I condemn other drugs to be an unhealthy mental escape for people, how different is this food for me? It's the robot mentality in me that wants a Flintstones vitamin complete dietary intake, so that I will not escape sorrow with anything but the answer to it. you always side with the 'man' carter. i'm not surprised.